There are a lot of entertainment options in Las Vegas. Some of the shows in Vegas are pretty pricey and tickets to some of the most more elaborate stage shows can run $100 to $200 each. But there also many free and reasonably priced attractions in Vegas to help keep you from busting your budget. Today I'll be giving some general suggestions on keeping your Vegas entertainment spending low as well as a list of free and reasonably priced attractions. I'm not opposed to spending money on an enjoyable vacation experience. You could go to Vegas and spend zero money on entertainment but what fun is that? Some of the best shows in Vegas are a bit pricey but I feel that many of them are well worth the experience. Of course you have to keep your spending under control and within a reasonable budget for your finances and spending more than you have to doesn't serve any purpose. Figure out your budget and then find entertainment options that appeal to you and will fit within that budget. Before you go to Vegas it is a very good idea to do some research to find out more about the attractions and decide which ones you are interested and which ones are not worth the money. To get an idea of what people think are the better attractions in Vegas you can see the 'Things to do in Las Vegas' list at Tripadvisor. You can find information on attractions from travel guides as well. Frommers has a list of attractions and Fodor's has a list too. If you have a specific show or set of shows in mind that you are interested in seeing then you may be able to save some money by hunting for discounts. There are frequently discounts on entertainment attractions in Vegas. You might be able to get 2-for-1 discounts to a popular show by booking your rooms at the hotel that hosts the show. If you do a google search for the show and the keyword 'coupon' or 'discount' then you may find discount offers from 3rd parties. You can also check to see if your employer or any clubs or organizations you are a part of offer discount rates. AAA members, students and military members can usually get discount rates at many attractions. Don't fall for timeshare sales pitches. When you're walking around Vegas you will eventually run into a booth with some salespeople offering free tickets to a show. Its been my experience that these free show ticket offers are an incentive to get you into a timeshare sales pitch. I'd avoid these offers. Free tickets can be a tempting incentive but you'll likely spend hours sitting listening to a high pressure sales pitch which isn't a great way to spend your vacation. All of the attractions mentioned below are places I've been myself with the exception of Red Rock canyon. There are a lot of free attractions in Vegas. Vegas.com has a list of free attractions in Vegas. Enjoying these free attractions is a great way to have a fun vacation without spending a dime. Below is a list of free attractions in Vegas. 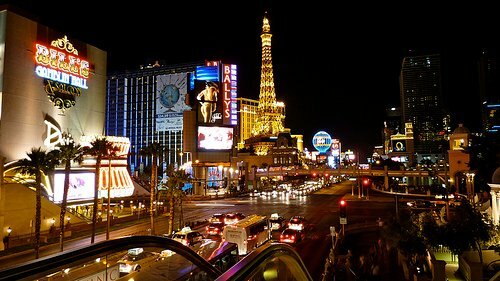 Stroll the Strip : FREE The Las Vegas Strip is a major attraction in itself. There is nothing quite like it anywhere in the world. 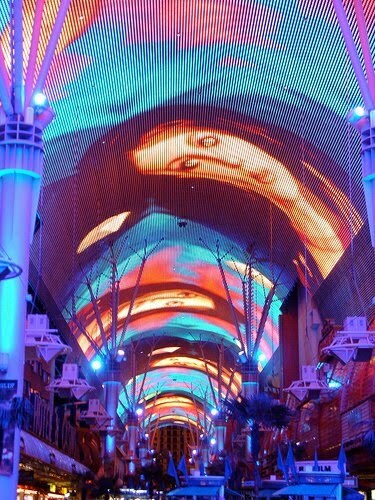 You can spend a few hours simply strolling along the strip and taking in all the sights. Along the way you can visit the major theme casinos and see the impressive decor both inside and outside. The landmark hotels like Luxor, MGM, New York, New York, Paris, and the rest are major attractions in themselves for both the impressive architecture and unique decor at each location. You can spend many hours seeing all the hotel casinos on the strip. Its a 4 mile trek from Sahara to Mandalay Bay so you might want to cut your site seeing into shorter chunks spread over a couple days. Fountains of Bellagio : FREE The Fountains of Bellagio are a water fountain show that is put on in a large pool directly in front of the Bellagio hotel. The water sprays high into the air and dances in patterns choreographed to music. You can't go wrong with the Bellagio Fountains in my opinion. Its free. Its right out on the street. Its Ranked #6 on the TripAdvisor list. Shows are every 15 or 30 minutes through out the day and evening. Fremont Street Experience: FREE The Fremont Street Experience is a giant overhead light and music show put on over four blocks of Fremont street in old downtown Vegas. The show is put on every hour on the hour after dark until Midnight. The music shows are musical medley tributes to such bands as Queen, The Doors or KISS. The experience is #52 on Tripadvisor. Your Hotel's Pool. : FREE (generally for guests) This isn't just one attraction but several attractions. Most major hotels in Vegas have a pretty nice pool. On a hot Vegas day, lounging by the pool or taking a dip is a great way to soak up the sun or cool off. Auto Collection at Imperial Palace : FREE with a coupon (or $9) I like old cars. So a museum of old cars is a pretty interesting attraction for me and this is one of my personal favorite attractions in Vegas. Its #73 on the Tripadvisor list. The Imperial Palace has a collection of 100's of antique and classic autos on display. The inventory rotates some with cars being replaced with others. They have a variety of unique cars like Johnny Carson's car. Many of the cars on display are also for sale. I could spend a couple hours wandering through the collection. You can get a free admission ticket online good through the end of 2010. Its open 10AM to 6PM and located in the 5th floor of the Imperial Palace parking garage. Siegfred and Roy's Secret Garden and Dolphin Habitat at The Mirage : $15 adults/ $10 kids The Secret Garden and Dolphin habitat is a pretty good exhibit. They have a number of large cats and several dolphins. #135 on the Tripadvisor list. Its not very big compared to a city zoo and its limited to large cats and dolphins. But they have a lot of the large cats and you get a very up close and personal view of the dolphins. Its probably a 1-2 hour attraction. Atomic Testing Museum : $12 for adults, $9 age 7-17, free under 7 yr. This is an interesting museum with a full history of the atomic testing that was conducted in the Nevada desert. I spent a couple hours wondering through the exhibits. This kind of thing isn't going to be appealing to everyone but if it interests you then I'd recommend it. Stratosphere Tower Observation Deck : $16 for adult or $10 children. The Stratosphere tower is over 1,100 feet tall and is at the North end of the main Strip. Its one of the best views of the city. They also have some thrill rides at the top that you might enjoy for extra fees. You can get package tickets like admission and 3 rides for $30. Eiffel Tower at Paris : $10 or $15 for adults. The half scale replica of the Eiffel Tower at Paris hotel has an observation deck at the top which gives another great view of the city. Speed the Ride, Coaster at Sahara : $10 for a ticket. This is another thrill ride. The coaster hits speeds of 70 MPH. Hoover Dam: $11 or $30 for tours. Hoover Dam is a short trip about 30 miles outside of Las Vegas. Hoover Dam is the largest dam in the Western hemisphere. Its a national historic landmark and has been named one of the top 10 construction achievements of the 20th century. Red Rock Canyon : The Red Rock Canyon National Conservation Area is 17 miles West of Vegas. You can drive through the CNA for $7 per car. Its the #13th most popular attraction on Tripadvisor which says "Visitors can admire colorful rock formations on several hiking trails or on a 13-mile scenic drive." What Would Individual Health Insurance Cost Me? What IS a Derivative Anyway?